In this second part of our interview with acclaimed violinist and editor Jorja Fleezanis, we discuss the future of classical music and symphony orchestras, as well as her recently-published edition of the violin part for Don Juan by Richard Strauss. If you haven’t yet read part 1, check it out! Ovation Press: Classical music (or music in general) is one of mankind’s most amazing and enduring accomplishments. But there is no question that we are in a transformative period in which people, art, and life are evolving and changing faster than ever before. In this cultural environment, what future do you envision for classical music? More specifically, what future do you envision for the symphony orchestras of the world? Jorja Fleezanis: I agree that the consequences of the world order, technology and the speeding up of the pace of life have made an impact on everything and how we spend our time. Like many others, I also believe that without a clear understanding of what place and what value the lively arts should have in our world order we are doomed to letting this technological freight train that moves us along to determine what we know and what we should listen to. There are two dichotomies in my last statement. One is that, more than ever, if you need a piece of information or need to hear a video/audio performance by a whole slew of fabulous artists, it is at your fingertips. The opposing side is, that if you don’t know what to look up to be stimulated and properly informed AND have no standards to help you determine what in the great YouTube warehouse truly represents artistic excellence, you will wander around aimlessly, unaware of what is what. How do we learn what to learn and what artistic excellence sounds like or looks like? Well, it has to come through education, and education that starts at the bottom level of introducing the arts to children at the beginning of their journey through life. We need vigorous and enlightened teachers to take on this charge and schools to readmit art and music programs into their curriculums. Symphony orchestras need to take the charge of being more proactive in music education for the young, the medium and the old in their communities, and not just by presenting a few token children’s concerts. Grass roots movements need to be identified to work together with the arts organizations in their community to ensure that the reason why human nature has struggled for centuries to seek self-expression through the arts and humanities is to make us realize what we are capable of when creative juices flow and what of that creative output is our salvation from turning into zombies who only eat fast food and watch the thinnest of broth as our entertainment. Ovation Press: Having been with the Minnesota Orchestra as long as you were, it must be especially upsetting to you to see what is going on there, with the labor disputes and the season cancellation. Can you give us your thoughts on the situation? The one unexpected silver lining in the terrible lockout of the Minnesota Orchestra’s struggle is the ground swell of people in that community voicing their love of music and why living without it is completely unacceptable. In some editorials, there have even been suggested ways for the community to rally their means to help make up the gap between the musicians’ idea of their worth and the wealthiest in the community not believing this possible. Right now I wonder if this impasse is simply a matter of not putting the question directly to the community so that both musicians and board/management can hear the answer simultaneously and work collectively to be sure such cultural hostage taking never occurs in a first world country such as ours. 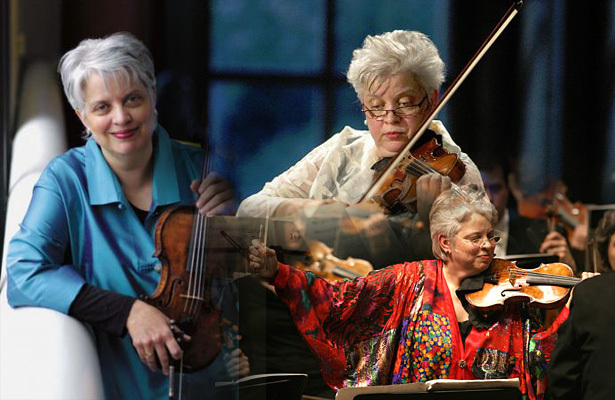 Ovation Press: As one of the first female concertmasters of a major North American orchestra, you were truly a trail-blazer for women aspiring to pursue leadership roles in music. 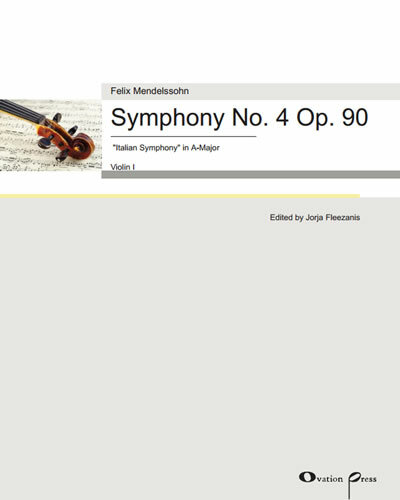 Did you see this as a major obstacle to overcome as you pursued the concertmaster position? Jorja Fleezanis: I was never invested in the idea of gender as a disqualifier. Through history there are legions of women who have established themselves as role models in literature, medicine, heads of state, visual artists and certainly musical artists. Growing up in the spirit of the 60’s and woman’s liberation, I was swept into this wave of empowerment that greased the wheel for my generation of women to get on with our dreams and not feel deterred. As a result as I grew up there were as many girls as boys in the summer camps I attended and the conservatories I went to. By the age of 18 my aspirations to become a professional musician were driven entirely by my fascination with and dedication to music. The depth of human expression that music opened up in me inspired the charge to defend music at the highest possible level and made me the kind of musical citizen I am. I have never looked back. 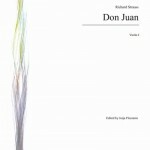 Ovation Press: We have just released your edition of Richard Strauss’s Don Juan. It’s such a fantastic work and was incredibly successful with audiences and critics right from the first performance in 1889–and it’s now a defining piece in the symphonic canon. 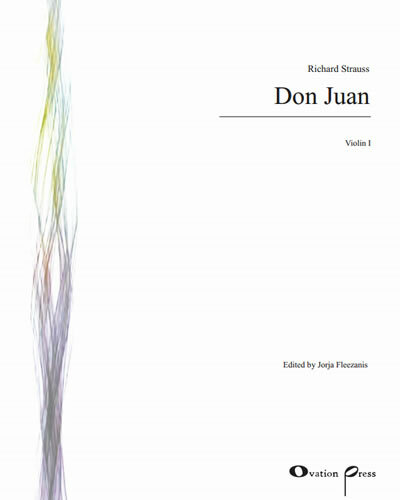 Having performed Don Juan numerous times over the years, do you have any stories to tell about playing it, learning it, or teaching it? Jorja Fleezanis: The poem by Nicholaus Lenau that inspired this work is in the front of the score and must be read if one is to truly understand the force of nature this work portrays so brilliantly. Being the theatrical genius of such gritty operas like Elektra and Salome, it is no surprise that Strauss would create ‘Don Juan’ into one of the most unrelenting and driving orchestral works in the literature. It is as virtuosic as its hero. For me, playing a note perfect version of any work without the blood and guts of the subtext, especially when it so vividly outlined by a source, is to miss the whole point. The opening gesture of seven fast notes, lunging upward after a gulp of quick silence on the downbeat, immediately sets us on course with flare and an unmistakable sense of this unstoppable, dominant character. Conductors such as Wolfgang Sawallisch and Edo de Waart, who had one foot in opera and the other in symphonic repertoire, brought visceral electricity to performances I played because they understood the larger than life subject matter and had the theater experience behind the language of Strauss in the opera house. Constant physical energy inside those many upward seven note figures throughout the work, the long melodic lines that are Straussian trademarks begging extreme fervor this unquenchable hunter of females, must motivate the performer very specifically. If you can make the connection of the point of this work to the ubiquitous first page excerpt many of you will play for auditions, you will never tire of working on the technical challenge as a means to a dramatic end. Ovation Press: Starting Don Juan when playing it for an audition is incredibly difficult. What specific tips do you have for violinists to help them tackle the opening run? Jorja Fleezanis: Here is my prescription for the that opening gesture: one, start firmly on the string, two, ONLY place the bow on the string on the upbeat inhalation the length of a half note in the temp, and three, the instant you exhale on the downbeat, PULL the bow as though you were letting go of a tightly pulled rubber band. Put a slight underscore pulse on the fourth note you play, which is on the third quarter note of the first bar, so that you very slightly balance between the first three notes as a pick up to the last four of the seven note figure. Ovation Press: That is truly a funny incident. Thank you so much for sharing your knowledge with us, This interview is indeed inspiring.